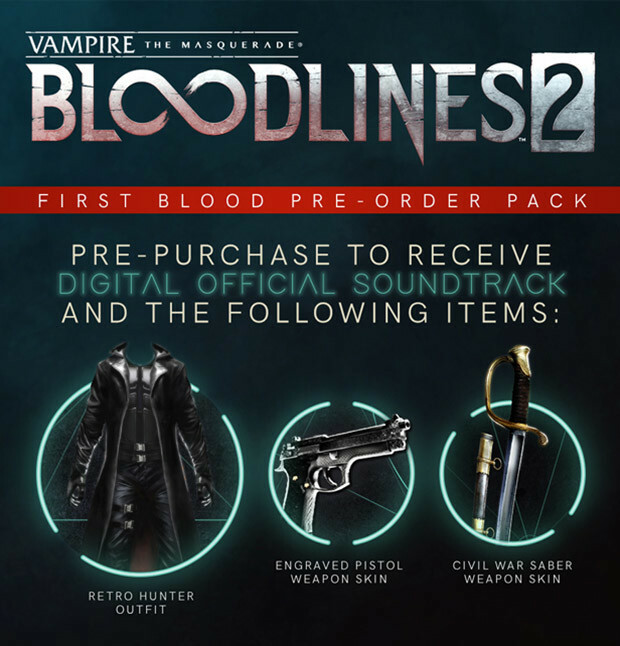 Vampires: The Masquerade - Bloodlines 2 coming March 2020. Pre-order today! At the GDC 2019, Paradox Interactive announced it's big hit Vampire: The Masquerade - Bloodlines 2. The publisher is most known from their genre of strategy games decided to invest it's resources and devote time into its role-playing games department. They took the inspiration from popular pen-and-paper role-playing games of White Wolf , the "World of Darkness". Although the content of the Bloodlines series slightly differ the typical vampire: The Masquerade scenario. Bloodlines 2 is developed by Hardsuit Labs (Blacklight: Retribution). Watch the announcement trailer for Vampire: The Masquerade - Bloodlines 2 here. Pre-order extras for Gamesplanet customers! Just announced at the GDC and now already available at Gamesplanet for pre-order. We offer three different editions at a discount. Each pre-order edition comes with the First Blood Preorder Package. That includes: an Original Soundtrack, Retro Hunter Outfit, Civil War Saber Weapon Skin and Engraved Pistols Weapon Skin. Vampire: The Masquerade - Bloodlines 2 will be released in March 2020, according to the publisher.